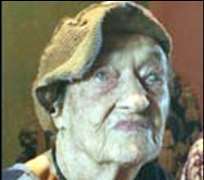 Mrs Wenger Susanne Wenger, the Austrian artist who dedicated her life to saving traditional Nigerian spiritual beliefs, has died aged 94. Mrs Wenger was a devotee of the animist culture of pre-Christian Yoruba gods from Nigeria's south-west. She won Unesco protection as a world heritage site for an under-threat sacred forest grove in Osun state. She lived in Nigeria for 58 years, supporting a large group of artists and fostering the town of Osogbo. The grove's few acres of primary forest are filled with sculptures by her and her students. he annual festival of the fertility god Osun held there in August attracts thousands of worshippers and tourists. She was buried in a secret ceremony in one of the shrines at the grove she helped save. Reclusive in her old age, Mrs Wenger gave what would be her last interview to the BBC in August. "I don't believe in legacies," she said. "Osogbo is a creative place, it did that by itself, it didn't need me." Her friends and adopted children said she was the "saviour" of spirit-worshipping traditions in Osogbo. When she arrived in Osun state in 1957, the practice of worshipping animist spirits had been all but wiped out by Christian and Muslim missionaries. She led the defence of the grove from developers - on one occasion lying down in front of a bulldozer - and prevented religious groups from destroying her sculptures in the grove. Sometimes a fearsome woman, according to friends and enemies alike, she encouraged Yorubas not to give up their traditional cultures. For some that meant rejecting even the most basic education, as schools were run by Muslim or Christian organisations that did not tolerate animist beliefs. Her funeral was attended by the area's three high chiefs and journalists were barred from entering. "Susanne Wenger left her mark indelibly on the cultural map of the world," Nigerian Unesco delegate Michael Omolewa said. "She will always be remembered for her impressive works and love of the Yoruba people."